I've been doing a bit of decorating in my new bedroom. The room is fairly small, about 12 feet by 10.3 feet, but since I downsized to a cozy twin bed it really doesn't seem cramped at all. I haven't decided exactly on the bedding yet, so I am still working that out. The room is primarily white and blue with touches of beige. I need a duvet cover and a bed skirt, but I am also reconsidering the bedspread. Did you notice my new lamp? Guess how much it cost. If you guessed free you would be absolutely correct. When I was moving, a man was setting things out in front of the dumpster. Everything looked new and I got several things. This lamp was one of the things I got and I love it. It is perfect for my blue and white bedroom decor. 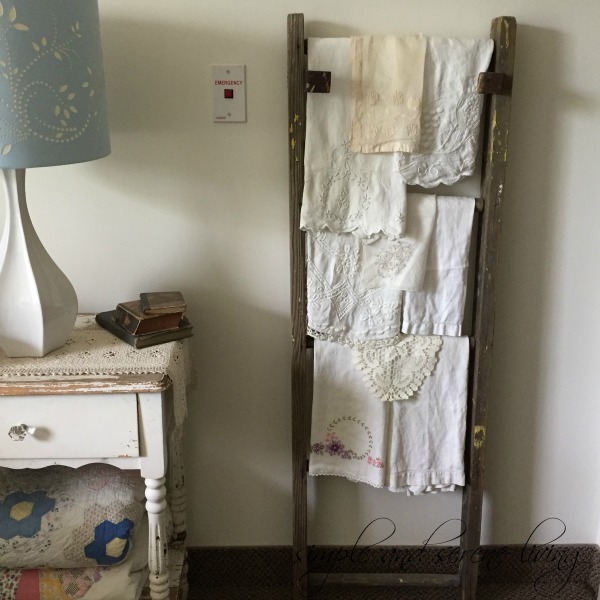 I moved my ladder where I hang some of my antique linens to the bedroom. I love it here. 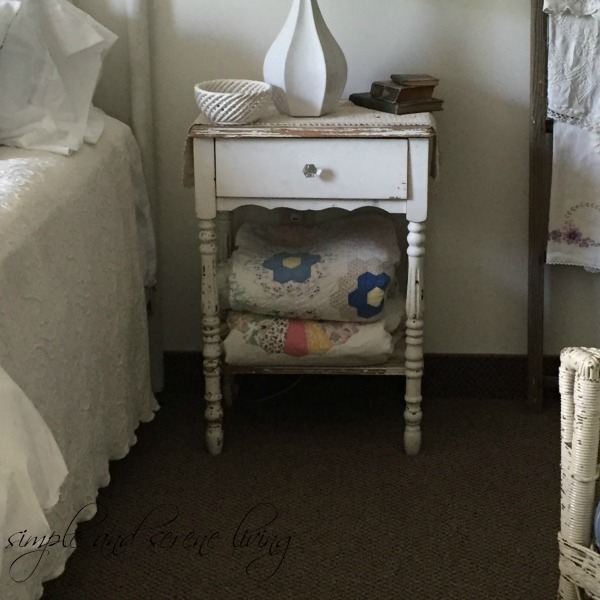 I tucked a couple of my antique quilts on the bottom shelf of my bedside table. I haven't really hung much on the walls yet because I am waiting to bring things from North Carolina in a few weeks. I am making progress and I am not feeling any pressure to get it done quickly. It is fun to just enjoy the process. It looks so comfy!!! Congrats on the great (free) finds! I looks so nice already. 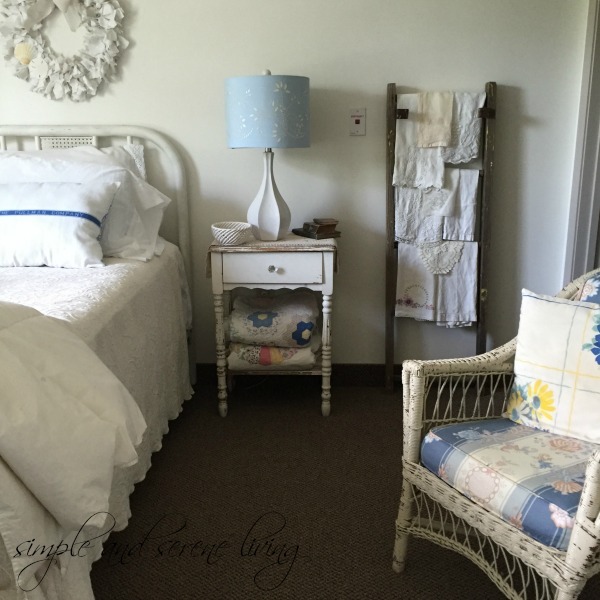 Love the lamp and your bedroom is looking so cozy!! 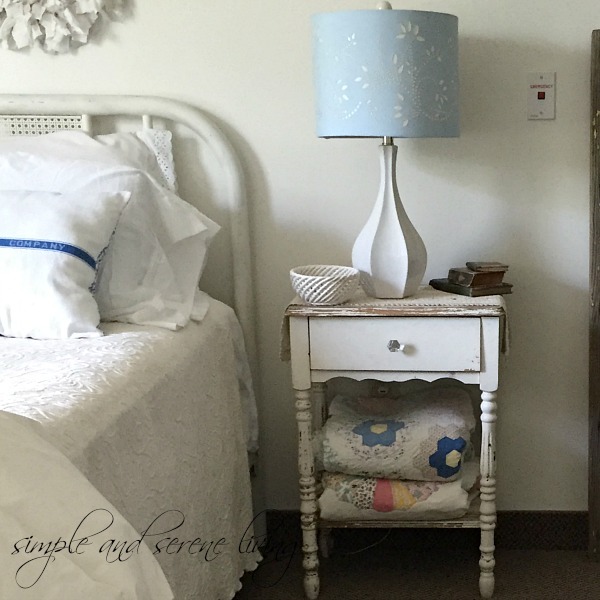 This is a charming bedroom, I adore this lamp! You had to be amazed and thrilled all at once at this perfect find. So happy for you and I hear contentment in your writing. I so appreciate your kind visit to me this morning, thank you. Laura, it looks very homey already and I can appreciate the need for a fresh, clean and simple look in the bedroom. And btw, you scored on the lamp!!!!! Your bedroom is so charming and serene. I can't believe someone threw away that lamp! It's so pretty. Love it! looks cozy and serene and relaxing and sweet. Love that wicker chair and the blues are some calming. Blue and white has always been one of my favorites for decorating. I used to go to a beach house with my family when I was a little girl (on the Oregon coast) and the kitchen and dining rooms were totally white and blue.. nothing else! and I always wanted to copy it but never have. Just love how calming it is. 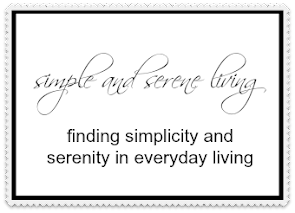 How fun that you are feeling no pressure and just fixing and making it yours at your own pace. That switch to a twin bed was probably a really smart move. It gave you so much extra room to play with or leave empty depending on what you feel at the time. I know I sleep in one place on my double and the other side almost makes itself up. 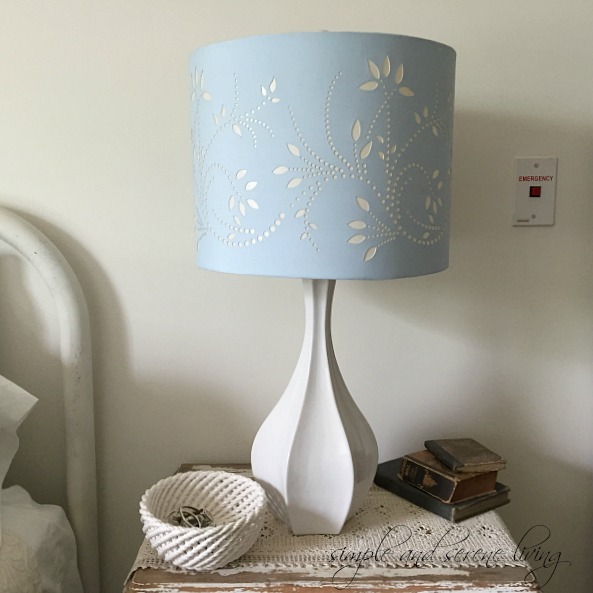 I do love that blue and white lamp. Best price ever. I like the wicker chair to and the quilts. I think it is coming along quite nicely. You created such a calm and serene atmosphere in this room. I love seeing you nest and settle into your new home!!!! Ahhhhh.....home sweet home! !